Lanka Business Online says, Sri Lanka plans to amend laws allowing foreigners to invest in government bonds, as they are too restrictive to overseas investors. Overseas investors have to hold securities for at least a year if they plan to re-sell to a Sri Lankan resident. The clause does not apply if the securities are sold to a foreign investor during that one year time frame. Overseas investors need to open a rupee account or a Treasury Bond Investment External Rupee Account (TIERA) to route their investments. As at end 2006, Sri Lanka’s outstanding debt portfolio had climbed to 1,152 billion rupees of which 901.3 billion rupees is on account of treasury bonds and 251.2 billion rupees in treasury bills, according to central bank figures. (NIDAHASA News) Parliamentarians from both ruling party and opposition yesterday (03) called for the dissolution of house and immediate election while ongoing political uncertainty causing Colombo Stock Exchange (CSE) to close at their lowest in over five weeks. Maithirpala Sirisena's victory on January's presidential election ended a decade-long Rajapaksa regime; but the minority government he appointed with his main alley Ranil Wickramasinghe as Prime minister is facing trouble as Rajapksa loyalists still dominate the house. The main stock index fell 0.64 percent to close at 7,149.46, lowest since April 28. The fall, for the third straight session, was the worst single-day loss since 30th of March. Political uncertainty is the main reason for this fall, stock brokers say. Ruling United National Party (UNP) earlier expressed their support to dissolve the parliament after Sirisena's 100-day program schedule ended in April. But United Peoples Freedom Alliance (UPFA), now led by President Sirisena and holds the majority seats in house maintains that a general election should be called only after proposed election system reformation are done. Sirisena, in his 100-day program, promised reformations reformation to curb powerful executive presidency and change election system. However he was forced to water down previous constitutional amendment due to the pressure of opposition. (NIDAHASA News) Sri Lanka's new government presented an interim budget with sweeping relief for poor they promised in election manifesto. Supersized taxes on Casinos and large corporations expected to cover the cost of unprecedented generous budget giveaways; a Robin-hood style take, according to local media, by a government led by a Prime accused by opposition for neo liberalist policies in his last administration. Ravi Karunanayake, the finance minister of Ranil-Maithri interim government reduced the prices of 13 essential food items, domestic LP Gas and Kerosene dramatically while raising salaries of government servants by Rs. 10,000. Tax of 1 billion rupees on casinos, to be paid by April, expected to raise 5 billion rupees, while any company earning over Rs. 2000 million profits is 25% off its profit. Onetime tax of Rs. 250 million to be paid by mobile phone operators and telecommunication providers. Rs. 1000 million onetime taxes imposed on television stations dedicated to sports, apparently targeting a television station run by incumbent Rajapaksa's son, which accused of shady deals, causing major financial losses to state television and sport administration bodies. Financial Minister also “exposed” many other economic and fiscal mismanagement of previous regime, warning true public debt is as high as 89% of GDP as opposed to 74% as previously claimed. Karunanayake said, 2015 Budget expected a total revenue of Rs. 1,594 billion which consisted of Rs. 1,400 billion of tax revenue and Rs. 194 billion of non-tax revenue. Total expenditure and net lending was Rs. 2,990 billion of which recurrent expenditure was Rs. 1,465 billion and capital expenditure and net lending was Rs. 685 billion. Government plans to cut Budget difict to 521 billion or 4.6% of GDP, the lowest since 1977. Minister vowed to review of all major capital projects and contracts awarded during past six months. His coalition, throughout the election campaign, accused previous regime for its overpriced and corrupt development projects resulted in an added financial burden to the people. The interim government of Prime Minister Ranil Wickramasinghe and President Maithirpala Sirisena is expected to carry out massive reformations within a 100-day schedule, before parliament election in April. (NIDAHASA News) President Mahinda Rajapaksa who is controversially set to run for a third term, presented his 2015 budget to the parliament on Friday (24), with a range of handouts, that covered almost all sectors of the economy. In his budget, which Rajapaksa himself sarcastically called a “country bumpkin's budget”, he gave large benefits for people of rural areas, which form Rajapaksa's main vote base. However opposition dismissed unprecedented budget giveaways as election-targeted reliefs. President Rajapaksa, who is also finance minister, increased the salary of state employees and cut VAT by 1 percent while reducing water bills by 25 percent. He also promised farmers free seeds for growing rice next season and a 17.6 percent increase in guaranteed price for their rice. Sri Lanka’s budget deficit will be reduced to 4.6% of Gross Domestic Product (GDP) in 2015 from this year’s estimated 5.0%. Official Budget documents showed the Government has revised public investment down to 5.6% of GDP this year from an original 6.7% to cut down the deficit to 5.0%. By 2017, the budget deficit can be down to 3.0% of GDP, Reuters reported. Central Bank Governor Ajith Nivard Cabraal defended the relief-oriented Budget, insisting it was not targeting elections but rather “very much part of the plan”. “This Budget merely continues what was begun several years ago. People think reduction in electricity charges, for example, is an election gimmick, but it was clearly set out in the ‘Mahinda Chinthana’ in 2009,” he told a post-Budget gathering organized by KPMG last evening. 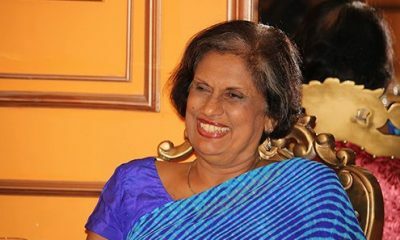 However main opposition United National Party (UNP) parliamentarian Eran Wickramaratne was quick to dismiss the Budget as little more than an election goodies list. “It’s an inward-looking, protectionist and giveaway Budget. It’s full of promises of pensions, subsidies and concessions. Clearly aimed at an election. The giveaways included vehicle duty reductions for Sri Lankans working overseas, the elderly, unemployed and others. The budgetary framework is largely unchanged. The private sector and exports will continue to be subservient to other socio-political objectives,” he said. The ex-bank head also pointed out the Budget failed to deal with larger issues of governance and improved financial accountability. Rajapaksa is likely to call an early presidential election amid his fading popularity. However some opposition groups are ready to legally challenge his third term, citing a technical error in constitutional amendment Rajapaksa put forward to remove two-term limit for presidency.